It's hard to look outside of what Garmin, Polar and Suunto offer when it comes to recommending a decent GPS sports watch. These companies pretty much dominate the sports tracking space. Sure, TomTom tried to wade into this territory and had some success. Ultimately though, the trio reigns supreme. 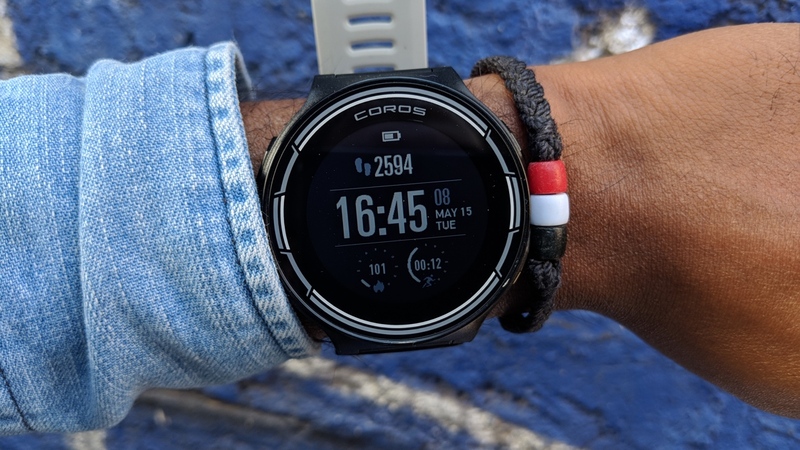 Coros is the latest startup to try to break this stranglehold and it's hoping to do it with the Pace multisports watch. Joining its collection of smart cycling helmets, the Pace is a sports watch aimed at triathletes with tracking support for running (indoor and out), outdoor cycling, swimming (open and pool) alongside a dedicated triathlon mode. It also packs in an optical heart rate monitor, all the sensors needed to double as a fitness tracker, ANT+ support to pair additional accessories and it makes big promises on GPS battery life, saying the Pace can keep tracking for up to 25 days. At $299, that puts the Pace up against Suunto's sub-$300 Spartan Trainer Wrist HR and the Garmin Forerunner 735XT. The 735XT is a couple of years old now but you can pick it up for less than $300 if you don't want to spend big on the award-winning Forerunner 935. So if the Pace does deliver, it could be a great fit for anyone who doesn't want to spend too much. I've been getting some test time in with the Pace (a full review is on the way) to see if this really could be a sports watch to rival Garmin, Polar and Suunto. Before I get into the testing, I have to talk about that design. They say imitation is the sincerest form of flattery and if you picked up the Pace and didn't see the Coros name above the screen, you'd think it was a Garmin at first glance. Less Forerunner 935 or Fenix 5 and more Forerunner 630 with its stretchy silicon band and circular watch face. It's sporty, not very stylish and there are definitely slimmer sports watches out there. The 43mm watch measures in at 11.8mm thick though so it's not a chunky one to wear, and at 43g, it sits light on the wrist too. There are four physical buttons in total, so no touchscreen display here to swipe through menus. Around the back is an optical heart rate sensor. The four magnetic pins alongside the HR sensor also tell you that this watch requires its own proprietary charging cable. It's not just the design that appears clearly inspired by Garmin. Even the software UI on the watch and some of the button shortcuts feel familiar. The top left button activates the backlight and provides quick access to the settings menu. The button below takes you into the sports tracking mode (so a reverse of Garmin's watches) while the two buttons over on the right take you through the additional data screens. There's phone notifications, a compass, calorie burn data, continuous heart rate data and a barometer to display real-time elevation data. Setting up the watch proved problematic. It took several attempts to pair it successfully to the Coros companion app and the supposedly easier QR code pairing option failed on every occasion. The app itself is surprisingly well designed, with tabs for daily activity tracking, workouts, badges unlocked and watch settings. There's also a handy calendar mode to quickly view data from previous days. The good news is that it will link with Strava so if you don't want to pore over your data in the Coros app, you have one of the best sports tracking apps in the business to export it to instead. So our full review will cover everything, but as I've only lived with the Coros Pace properly for a week, I've just managed to squeeze in some swimming and running time. What I can say is that I'm pretty impressed with what the Pace delivers so far. When it's time to track, it's a simple case of pressing that button on the bottom left corner and waiting for the GPS signal to pick up (if you're cycling, running or open water swimming of course). The good news is that with GPS and GLONASS support, picking up a signal is zippy. I wore it alongside the Garmin Forerunner 935 and it took roughly the same minute or so to lock on to a signal. For runners, there's a bunch of useful settings you can activate before you start moving. You can turn on the metronome as an aid for working on cadence, set up the auto lap mode as well as get cadence and HR alerts. It's all the kind of things you'd like to see on a serious sports watch even if you don't intend to make full use of them. Out on a run you'll get multiple data screens to display distance, pace, HR, cadence and elevation data. It's all really easy to glance at and get a good sense of your performance. Below are screenshots from a test run with the Pace and the Forerunner 935. I struggled trying to find the option to display the data in miles as opposed to km, but the 10.47 miles should translate to 16.8km on the Pace. The Pace recorded 17.08km, which works out to 10.6 miles. So it overshot the Garmin slightly, but not by an amount that would have me massively concerned about its accuracy. The mapping of the route appeared consistent, plus there are some nice graphs displaying data such as pace, cadence, elevation, heart rate, heart rate zones and lap splits. As far as heart rate tracking accuracy is concerned, I haven't put the Pace up against a chest strap yet but was keen to see how it would fair against the Forerunner 935, which is pretty adept outside of high intensity interval training. The average HR readings were generally 1-3 BPMs out while the Pace tended to slightly higher max HR readings, but the peaks and troughs in the HR graphs were pretty consistent and I was satisfied with what it served up for a steady run. The Pace can track swimming in open water, but I focused on seeing what it was like in the confines of my local swimming pool. Once you've picked from the 25m or 50m pool length options, there are a decent amount of settings to rifle through before starting. There's also an auto lock and you can turn on length alerts so you don't need to look down at your wrist to know you've completed a lap. For running, you'll get multiple data screens, showing real-time metrics including distance, average pace, lap time, distance and lap pace. There's also a screen dedicated to heart rate, but based on our experiences of optical HR in the water and the obvious issues with tracking BPMs, I didn't pay too much attention to this data. Post-swim, there's a raft of metrics to look over including average stroke rate and average SWOLF. Once you head back into the companion app, there's those nicely laid out graphs and I really liked the fact that it recognised the type of stroke for each lap. That's something you don't get on Garmin's Connect app. Data like average pace, SWOLF and stroke rate again were pretty consistent as well and I was happy with what the Coros delivered on the swim tracking front. I went in with pretty low expectations for the Coros Pace. This is a company that has never made a sports watch before and didn't have any heritage in the space. What I found though was a sports watch that appears to be able to go toe-to-toe with the major players. While the design is a little uninspiring and not very original, it's light and comfortable to wear and data is nicely presented on the watch. The companion app is what really surprised me and is often where a lot of the newcomers let me down. With Coros though, you get a pleasant experience when it's time to review the data. The question with the Pace really comes down to price for me. While first impressions are good, would I recommend this to someone over a Garmin, Polar or Suunto? It's tough to say. Perhaps if Coros came in at a lower price than $299, there might be a stronger argument to say, go for it. But with established names like Suunto and Garmin offering similar options in the same price bracket, Coros might find the Pace a tough sell. What I can say is that I'm certainly liking what I've tried and there are no reasons to knock this affordable GPS sports watch so far. Interesting, similar outlook to Amazfit Stratos which seems comparsble except comes with a handful of Firstbeat analytics at a $100 less (and syncs to Strava)....did Wareables ever review this? The question for the non Garmin, Suunto, Polar offerings of course is can they afford to maintain the backend ecosystems long term, which I guess will happen through getting people to buy the next and subsequent iterations of their watches...OR...selling their product to one of the big hitters. Our Stratos review is now live. I agree with you on maintaining ecosystems aspect. I do think Coros has something here, I just wish it had come in at a slightly cheaper price.